Here is another Freebie of the day! Earlier we posted so many Johnson and Johnson freebies and we are sure our users enjoyed those freebies alot. Now Johnson and Johnson is back with another amazing Sample giveaway. This time they are giving Nicorette Chewgum. 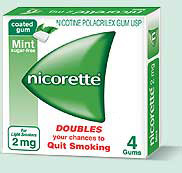 Nicorette Chewgum is use to for those who are tobacco addict and this chewgum is used to quit smoking. Nicorette is not just a chewing gum, but a complete infrastructure and support system that can help smokers quit the habit and lead a healthier life. How to get Free Samples? If you are a tobacco user(or some one in your family) and you want to quit smoking / tobacco then get a free sample of Nicorette. Our Readers have availed the Buy one get one offer from SherSingh.com and now they are back with another offer where they are giving Flat 25% off on already discounted Shirts. They have Some High Quality Shirts at Great Price. Follow the below steps to avail 25% additional off. How to avail additional 25% off on Shirts at Shersingh? Add to cart & 25% off will be automatically done.